Hello and welcome to the third Inspiration Station challenge!! This challenge is something my sister and I started, for us to have just another reason to get inspired and create, without the pressure of deadlines or rules. 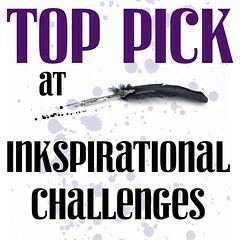 You can check out the what I created for the first and second Inspiration Challenge, if you like! This time, I chose something from the products of the store Seedlings Cards, which I came across from Paper Crave‘s website. There are plenty of fantastic whimsical card designs on the website, but my sister chose this panel of cards, from which I extracted the color combo. I was completely inspired by the colors. I actually wanted to create something whimsical, but in the end, I gave up since I wanted to use this new stamp set I bought – MFT Gill Friends. I didn’t have any fish/sea themed stamps with me until now, and I couldn’t wait to try this!! So, I went with the look of the bottom right card featured in the picture. Sea and fishies.. I started with the background. Tried out the technique taught by Jennifer McGuire in this post. Adding plenty of watercolors from my Gansai Tambi set, I used some scrunched up plastic cling wrap on it, left it to dry before removing the cling to get this amazing texture. For the fish and the underwater plants, I used the same method – I first heat embossed it using white embossing powder, then colored the pieces by blending in distress inks. I then fussy cut the images. Combining everything – I trimmed the watercolor background, foam mounted it on a white card base. I adhered the water plants directly, but foam mounted the fishies and also the sentiment. I started with a bright white paper, Fabriano Elle Erre Bianco. I had initially thought of using watercolor paper, but since it was a little off-white, I changed it. And since this wasn’t watercolor paper, I used Zig Brush pens for coloring, and then a little bit of distress ink for watercoloring the greens later. Just kept the water minimal, so that the paper wouldn’t warp. To start with, I stamped all the images, from Altenew Peony Scrolls, Altenew Golden Garden and Winnie & Walter In Bloom: Addies Garden using Versafine Onyx ink. Once this was completely dry, I started coloring them. I also stamped the flowers separately, colored and fussy cut them, to adhere them on top of the piece. The sentiment comes from Reverse Confetti Banner In Bloom. The design on the base cardstock comes from Ranger/Tim Holtz Boundless Flight stamp set – something I have in my stack since God knows when! 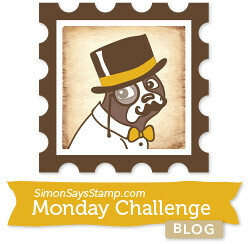 I am glad to have used this beautiful stamp here to add a bit to the otherwise plain background. So, that’s it from me. 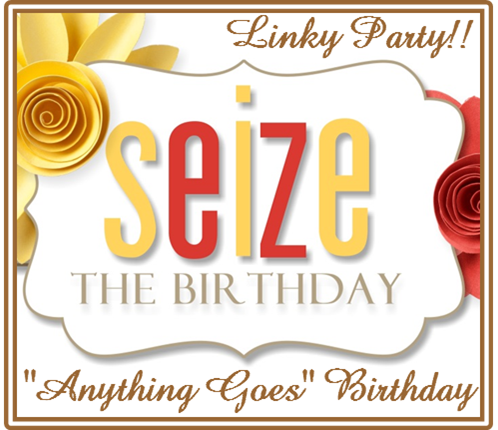 Stop over to the Seize the Birthday challenge blog for more inspiration from our talented Party Guest Tenia Nelson and from the rest of our amazing team! I used Paper Trey Ink Rustic White for the card base. The sun and the cute elephant are from Happy Little Stampers Whimsical Friends, and the balloon from Simon Says Stamp Birthday Bits, which I stamped using Memento Tuxedo Black. The sentiment is from Hero Arts Fanciful Swirl, which is an alphabet stamp set. I colored the images using Faber Castell oil pastels and baby oil. I drew the balloon’s string and the clouds using a black pen and colored them too. Once considerably dry, I added some light glitter using Wink of Stella clear brush pen. For the envelope, I used purple color paper (I would have preferred blue, but I didn’t have the right color) and stamped the same elephant and balloon using Memento Tuxedo Black, along with the sentiment. 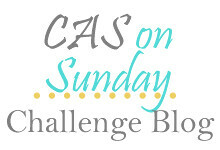 Hello and welcome to a brand new challenge at Seize the Birthday! 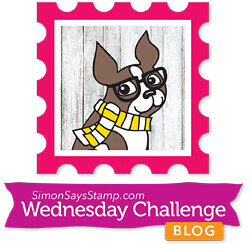 To join the challenge all you have to do is create a fresh, new birthday project. You have an optional choice of using a ‘Topping’ in your creation, and this time, this topping is ‘Dots & Stripes’. I first made the backgrounds. On one piece of cardstock I used My Favorite Things Bold Diagonal Stripes stamp with Versafine Onyx black and on the card base, I used Winnie & Walter Mini Scenery: Spotty stencil using Black Soot distress ink to apply. I then trimmed a part off the diagonal stripes piece and foam mounted it on the dotty background. For the flowers, which are die cut from Altenew Peony Dreams, I used photo paper and watercolor on top. These are cheap watercolors I used, but they worked pretty well. Since the paper is not made to absorb ink, spotty patterns formed when I watercolored on them. So pretty! I then adhered them, piece by piece. After adhering the flower and leaves on the card, I added the sentiment – from Altenew Label Love and Paper Trey Ink Wet Paint 3, and foam mounted them on top. I added some gold sequins scattered around the card and in the flower’s center, for some embellishing. Timeout Challenge #131: Inspired by Words: Hugs, Kisses and a lot of Birthday Wishes – where they are also celebrating their 5th Birthday!! Yay!! Congrats to Sandy and the fabulous DT!! I hope you are inspired by my creation! Hop over to the Seize the Birthday blog for more inspiration from our amazing DT and our amazingly talented Surprise Party Guest, Tenia Nelson, and join us with your own birthday project!